I am an experienced hiker, backpacker, and camper, and am gaining more experience with winter camping every year. I hike every day, and backpack when possible, which leads to many weekends backpacking and camping each year. I try and take at least one annual week-long backpacking trip in addition to many one to three-night weekend trips. My style can best be described as lightweight, but not at the cost of giving up too much comfort. I generally sleep in a tent, and seem to be collecting quite a few of them to choose from. The Gerber Crucial FAST came in a cardboard box without any literature. Printed on the box, is warranty information (Gerber warrants to the consumer that this product will be free of defects, in material and workmanship for as long as you own the product. ), and basic philosophy behind the Crucial FAST. There are no instructions for use or care. The Gerber website explains that "The Crucial F.A.S.T. is the first and only pocket tool available with assisted opening blade technology." F.A.S.T. stands for Forward Action Spring Technology and is designed to easily open the knife blade with one hand. Only the knife blade has this feature. Pocket Clip on the Gerber Crucial. To me, the Gerber Crucial FAST seems like a hefty little tool. At just over 1/3 of a pound (163 g), it feels quite solid in my hand. The red and black handles are attractive. The red handle looks to have an anodized metal surface. The black handle also appears to be anodized, but has an additional piece on the side, which forms a textured G10 (glass epoxy) grip. There is a lock for the blade on the black side of the black handle, and a pocket clip on the opposite side. The Gerber website states that there are eight components to the knife, and then proceeds to list seven. 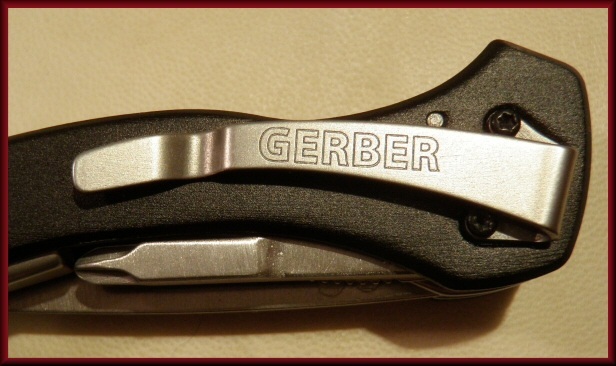 It seems to be common practice to list as many features or components as possible on a multi-tool, and in my opinion Gerber pushes it a little here. In reality, there are only four items which can protrude from the tool, albeit several have more than one feature. There are two screw drivers, one knife blade, and the pliers. The pliers are actually needle-nose, regular pliers, and a wire cutter in one, so that's three components so far. The flat blade screwdriver is single use, but the Phillips screwdriver also contains a bottle opener, bringing the total to six components. There is only one remaining extremity on the Crucial, and that is the blade. I think the missing eighth component comes from the fact that the blade is both half fine and half serrated, which would give us eight components, counting the blade as two. The Crucial knife blade counts as two components (smooth edge and serrated edge). The functioning of the tool was a little stiff right out of the box. Opening the Gerber Crucial into the plier configuration took some pretty forceful pulling. The screwdrivers opened easily. The evidence of the FAST technology is very apparent when opening the blade, although it did take some limbering up to get it to "snap" into the fully locked position. As the knife gets looser, and I get more proficient, this has started to work quite well. 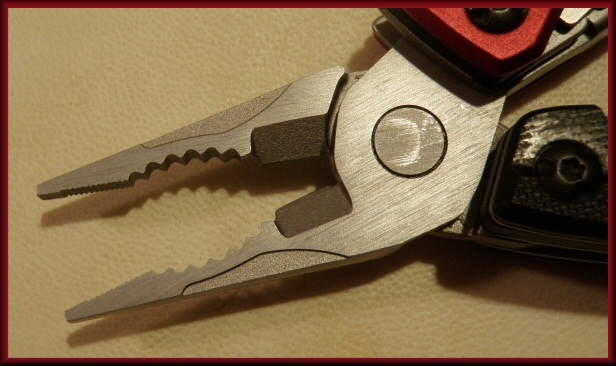 The Crucial Pliers count as three components (needle-nose, regular pliers, and wire cutter). The two screwdrivers and the blade all lock into the extended position. The screwdrivers use more traditional spring locks, which need to be pushed aside to retract the drivers. The blade lock is incorporated into the FAST forward action spring, and a little slide button on the outside of the tool needs to be activated for the blade to release so it can be folded back into the tool. This slide can also be slid when the blade is collapsed, locking it in the closed position, preventing it from accidently opening. Standard Screwdriver. 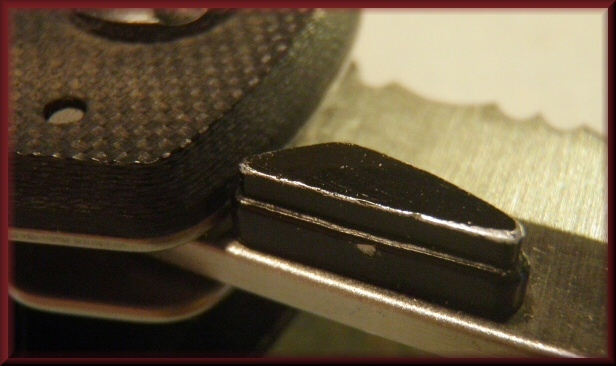 The serrated metal is the lock which is pushed to the side to release the driver. Red means "Warning". With the red dot exposed the knife blade is unlocked. The raised black surface behind the slide is the G10 Grip. The small black material on the blade is the "thumb stud" for easy opening. 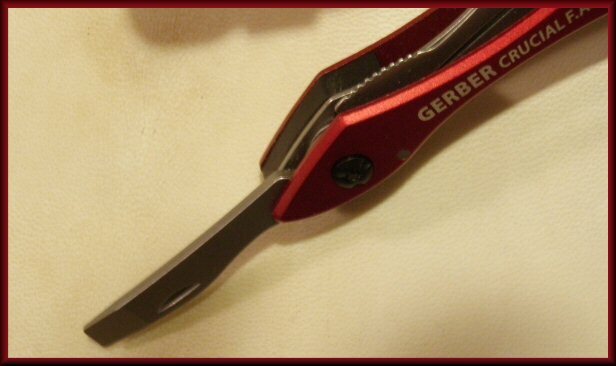 The Gerber Crucial FAST Red Pocket Tool is attractive and seems comfortable to hold. The finish is nice, and the pocket clip seems suitably long enough for use. The blade and drivers snap solidly into place and seem quit secure when locked. They are also easy to return to the folded position. The pliers take more effort to unfold, and fold, but they too seem well made, solid, and stay nicely in the usable position. So far everything seems first rate about this tool. It is pretty much what I expected, although the folded length is about an inch (2.54 cm) shorter than that reported on the website. I suspect a typo. I have carried the Gerber Crucial FAST Red Pocket Tool with me a lot during this portion of the test period. On daily morning hikes of about two miles (3.2 km) during the week, hikes ranging from five to seven miles (8 to 11 km) on weekends, and on three one-night, hike-in, backpacking trips to Pinicon Ridge County Park, in Eastern Iowa. Temperatures have ranged from about 65 F (18 C) down to 19 F (-7 C), during mostly dry conditions, although in an occasional light rain. I have tried to always have the Gerber Crucial nearby, so I have carried it with me in my pocket, my messenger bag (which I use as a briefcase for work), and in my truck. As mentioned above, I've tried to have the FAST Red Pocket Tool with me at all times. That is because I never know when I might need it, and I didn't want to miss any opportunities. Primarily I have used the knife tool. I have used it to dice a habanero pepper, slice some hard salami and cheese, and whittle wood to make shavings for fire starting at camp. On the trail I have really only had occasion to use the knife, and the flat screwdriver. The serrated knife blade came in handy when I came across a short section of trail overgrown with some vine type foliage. Without too much effort I was able to make the path more passable for the next hiker. I used the flat blade screwdriver to change the batteries in my headlamp on one occasion. The buckle on the lamp's headband is designed for this task, but I must say it was much easier using the Gerber. The Phillips screwdriver came in handy at work when we were removing some legs from a table in order to remove it from a conference room so there would be space for a food drive. Someone asked "anybody have a Phillips? ", and I thought "heck yeah, I do." I have also used the pliers and wire cutters when doing some electrical work in my kitchen. It was nice to have the Gerber at hand and not have to climb off the ladder to retrieve any tools. 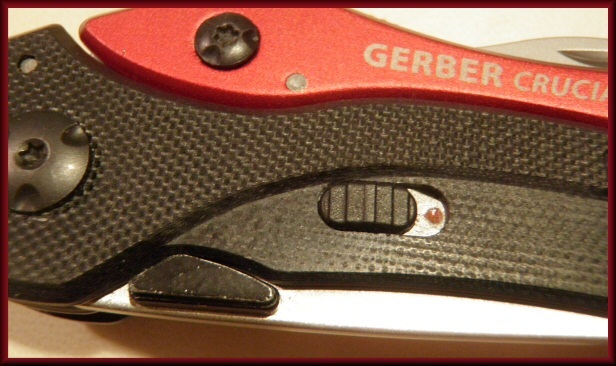 The Gerber blade stud is showing some loss of paint. 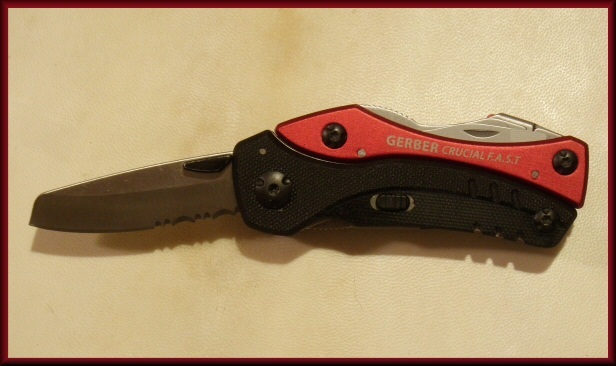 The Gerber Crucial FAST Red Pocket Tool has been handy to have around. I have observed the paint getting worn off the thumb stud used for opening the knife blade, but otherwise the tool is in excellent condition. I did drop the Gerber once, having it slide about eight feet (2.4 m) down some mossy rock. The tool was undamaged but the knife blade had partially opened. I dropped it again and the blade opened again. Up until this point I hadn't bothered with the "lock-closed" feature of the knife, as it remained nicely closed with normal handling. Since then, I always make sure it is locked. I don't want it accidentally opening in one of the pockets of my pack, or in my trousers. The Gerber Crucial FAST in my shorts pocket. Another observation is that the FAST Red Pocket Tool is heavy. Not too heavy to use, or to carry, but when clipped inside my pocket it does pull on the opening. In the pocket of some heavier shorts (above) it worked quite well. In my lighter-weight hiking pants (below) it tended to pull a little more. The Gerber Crucial FAST pulling on some lighter hiking pants. The final observation is that of the pocket clip. 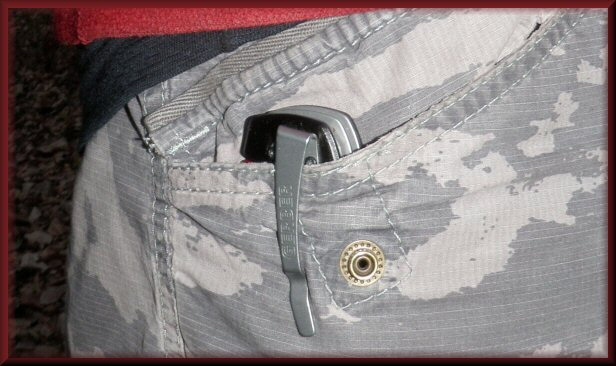 When clipped into my right pants pocket, my preferred way of carrying it, the knife blade pivot-point is up. So when I pull the Gerber out with my right hand, the knife rests backward in my hand (below), and I have to turn it around in order to flick open the knife. 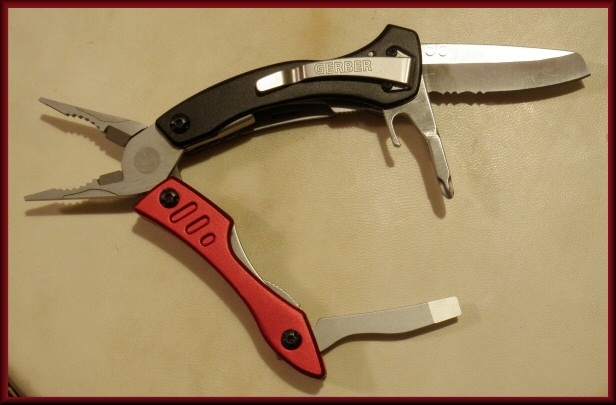 This seems a little unfortunate with the nice one-handed blade release, but studying the tool I believe the clip would cause issues with maneuvering the pliers if it were on the other end. 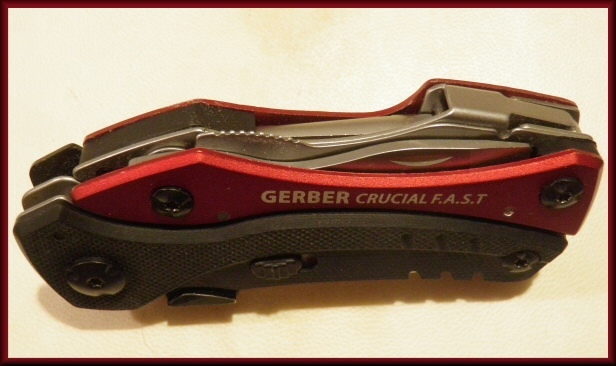 The Gerber Crucial FAST sits naturally backward when removed from the clipped position. This is a handy multi-tool, and I am enjoying using it. The blade is secure and sharp. All the tools lock solidly into place, and the spring-loaded knife blade is fun to flick open. The size of the tool chassis is such that it is easy to get a solid grip (although slightly uncomfortable) and apply substantial force to the screwdrivers, knife, or pliers. 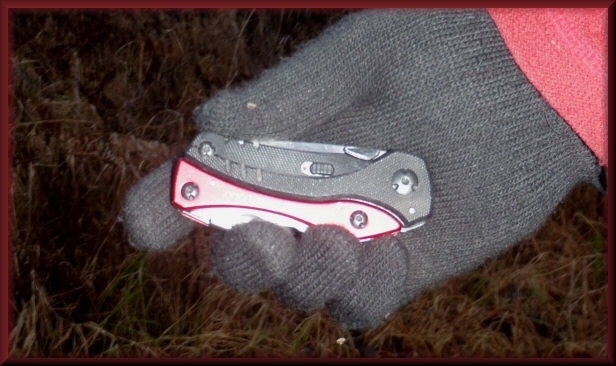 I have used the Gerber Crucial FAST Red Pocket Tool with light gloves on and found it easy to manipulate. I have continued to carry the Gerber Crucial FAST Red Pocket Tool with me pretty much all the time throughout the entire test period. As in my Field Report, this includes daily morning hikes of about two miles (3.2 km) during the week, and hikes ranging from five to seven miles (8 to 11 km) on weekends. I have also taken the Gerber on a two-night backpacking trip to Palisades-Kepler State Park, and a one-night, hike-in, backpacking trip to Pinicon Ridge County Park, both in Eastern Iowa. Temperatures have ranged from about 60 F (15.5 C) down to 0 F (-18 C). This has been an unusually dry and warm winter. In January when the average high is 26 F (-3.3 C), we had a day up to 60 F (15.5 C) and several days above 50 F (10 C). That being said, we've also had temperatures around 0 F (-18 C), but not the usual consecutive days where it never gets above 0 F (-18 C) as in most years. Snowfall didn't really occur until January, and has been light, as we've only had two 5-inch (13 cm) and one 2-inch (5 cm) snows. Gerber Crucial reflecting some sunlight on a snowshoe outing. My field testing has pretty much continued as described in the previous section of this report. I've had the Gerber Crucial FAST Red Pocket Tool with me almost constantly, including day-hikes, backpacking trips, in and around the house, and when driving to various destinations. I did use the bottle opener (located on the Philips screwdriver) when opening beverages while we were lighting off fireworks with my cousin (a fairly recent Thanksgiving tradition). It worked flawlessly, and of course was with me outside. 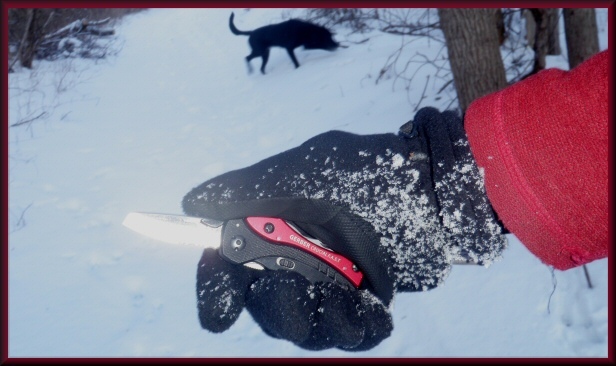 I also took the Gerber with me to Missouri over the Christmas holidays, and besides accompanying me on several hikes, it came in handy for cutting nylon ties, and breaking down boxes after the Christmas festivities. For actual trail use, I have cut some hard salami and cheese, and whittled strips of wood for starting fires. 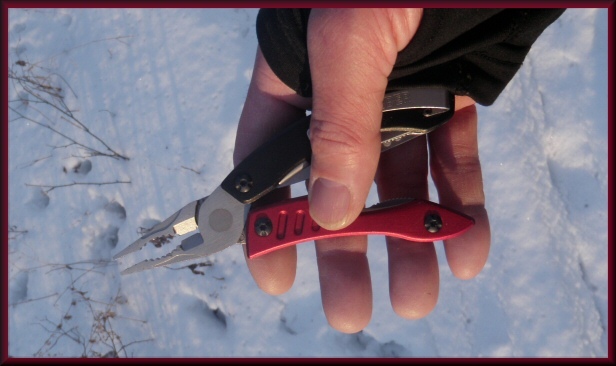 I also had occasion to use the pliers when the integrated belt on my hiking pants broke in the cold. It's a little hard to explain, but half of one side of the buckle broke off, and I was afraid I was going to have to hold on to my trousers the remainder of the trip. Studying the belt and buckle I decided to try and pull the webbed belt through the remaining portion of the buckle with the Gerber pliers. This worked great! The folded end of the webbing keeps it from sliding out of the buckle, and there's enough of a tail on the belt to loosen it far enough to remove the pants. Another time I was glad I had the Gerber, was when I was gathering some wood for a fire. I got a couple of small splinters in the palm of my hand. I first tried the guy-thing, biting the splinters to remove them, but to no avail. I put my gloves on and proceed with the fire, but the splinters started bugging me. So I opened up the Gerber to the plier position, and was amazed that the tip of the plier was precise enough to remove two very tiny splinters. The Gerber Plier feature came in handy a couple of time while hiking. 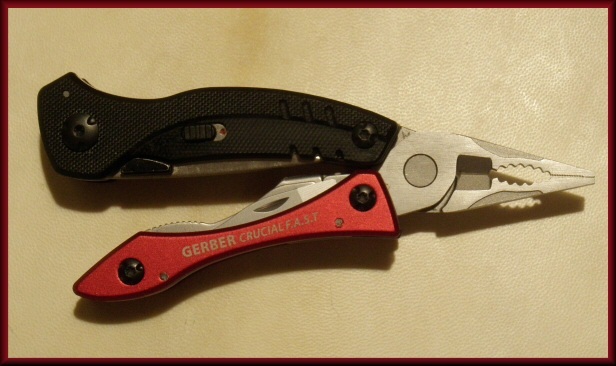 The Gerber Crucial FAST has been great to have with me, both on the trail and at home. All the locking devices work well, and once locked, each of the tools is very securely held in place. The FAST (Forward Action Spring Technology) on the blade is easy (and fun) to use when flicking the blade into place. Except for a few mostly unnoticeable abrasions, the finish remains in excellent condition. My only suggestion would be for the pocket clip to be on the other end, so that when I pull the Gerber from my pocket it is in position to flick open the blade. Otherwise, this is a dandy device that I am happy to have and use. This concludes my reporting on the Gerber Crucial FAST Red Pocket Tool. Thank you to Gerber and backpackgeartest.org for this testing opportunity.